Once again I went with some fabric and costume loving friends to FIDM. One of them was a professor of costume design – can’t get better company than that! I’m not mentioning which films, because in most cases I don’t know. The only one I saw was La La Land, and the costumes were nothing to write home about. I am sharing only a few images of the full garments, I’m finding that it’s the details I love. Sure on a big screen this is what pops out at you. But this is what pops out at me, the details. The materials used, the subtlety, the effect that light has. The amazingness of silk. Just using different silks, slight changes in the shades of color. A little fabric manipultion, and we are ready to go! The fantasy films are where the mens’ costumes thrive. Really what can you do with a business suit? But create a fantasy warrior and go to town on the textures! Yes, that is a red cape, which highlights all of the wonderful braid, fabric and leather. Leather, coarsely woven fabric, andmetallicc embroidery! As well as some fur. Who says men can’t have fun? A closer look, metal work and some bright purple silk. I’m sorry the focus isn’t great. I can’t use my flash. But I think you get the idea. The robe is made of those ball chains. For some reason I adore those chains. So to see a full length garment made out of them! Swoon! Really I need to see the movie to see how it moves, but I forgot which on it is. OK, this is from Alice Through the looking Glass. We immediately decided that the nettle that the Red Queen is wearing (maybe it’s not the Red Queen, I’m just making a guess here), was made on a three D printer. I don’t know if this is Alice, what I do know is the colors and the Chinese influences are wonderful. I love when a designer references the source but does her own thing. In this case it is Colleen Atwood, she costumed at least three of the movies in the show. In a you-tube video she discusses this outfit with it’s handwork and Chinese influence. Love the shoes!!! The eel is too high for me, but oh my, these are gorgeous. Alongside the movie costumes there is always a smaller exhibit. In this case costumes and clothes from the 1920s. This dress was used in the Orient Express. I would wear it today! A knit dress with embroidery and insets. The detail! The color! I want this dress! 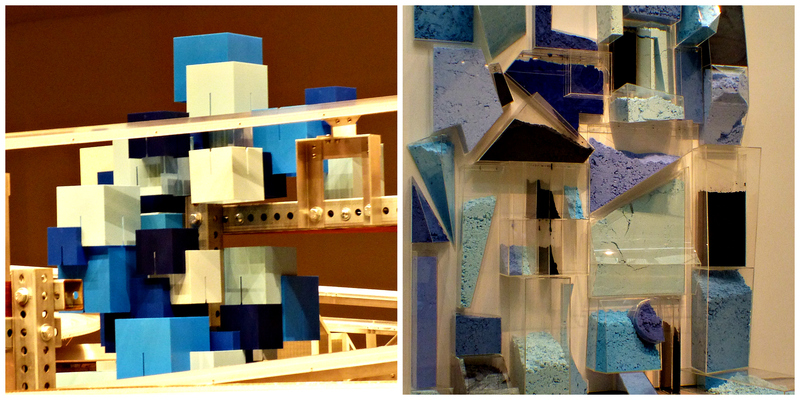 So if you have a chance, get over to FIDM, this year the exhibit is excellent. Probably because of Colleen Atwood, but not only her. Last year was very meh. This being the 25th year they really went after the best costumes the movies had to offer. Similar things happen at the same time, it’s the zeitgeist. So while LAMCA has it’s Reigning Men Exhibition, FIDM has Man Mode. Much smaller of course, but the same themes, like how to make menswear exciting for the runway. Or, computer generated desgin on printed fabric. In the accesory catagory, it’s all about the tie, really the only place a businessman can hope to express himself. Then there is the banyan, or house coat, for lounging around the house. He still looks overdressed, Fez and all. At least the embroidery is delightful. Looks hand embroidered in the good sense of homemade. Good quality but a certain freedom of design. Unlike 18th Century formal wear that was exquisitly embroidered, also by hand, but by people working in an atelier. About as close as machine perfection that you could find in those days. So did this caftan come west? Was it worn by a man of liesure in Europe? Or was it saved from some nomads tent and cherished as a beautiful example of central Asian textile and not as a garment to be worn? A fabulous example of the Smoking Jacket, made from Cigar silks. There ae many jackets and quilts that took advantage of these thin strips of silk. Even with the company names stamped right in the middle. Lovely hand embroidery was used to attach one ribbon to the next. Using silk thread in matching colors, the gold and red. And finally, a little humor. How riske are this boxer shorts. A true fantasy for any man. Art of Television costume design. TV shows on the independent channels, like Netflix and Amazon, are so much better than movies these days. The same can be said about the costuming for TV shows. FIDM has been putting on the movie costume show for 26 years, the TV Costume show is celebrating it’s the tenth year, and it is so much better than the movie show. I’ll start with Outlander. No, I haven’t seen the show, I hated the first book and left it at that. But this isn’t about the show itself, it’s about the costumes. I was with my friend Ruth who taught costume design, she thought she was boring me with the details. I loved it. She said the 18th-century silhouette is here and is captured beautifully. As for the embroidery – that is a modern embellishment. This man’s waistcoat is a sight to behold. From the embroidered images I’m thinking bad guy? The Designer certainly knows her illuminated manuscripts very well. Both the bird and the bat are straight from medieval European manuscriptsNo one ever saw those teeth on TV, which is why these shows are so wonderful, getting such a close-up view of very well made costumes. Since Cumberbatch wasn’t part of the show, the only thing we care about is the Deer Stalker hat – that wasn’t in any of the books. I think this was mid to late 19th century. Of course, for me, it’s about the details. 20’s style dress, great use of bias tape. Ruth complained about this set, it will look flat on camera she said. She is right, here is my image from my camera and the dresses have no depth, even though they have great detail in real life. Fantasy shows are always fun (I think this is from Defiance) take the Scottish Highland outfit, kilt and all, but knock it up about ten notches. Wool, leather, snakeskin, an amulet from the Himalayas (or a facsimile of one). Once again, a pleasure to see up close. The joy of Sci-fi is as much in the costumes as in the story. Someone had a lot of fun working this leather. Someone else had a blast distressing all of these items of clothing. This I do know is from the Walking Dead. But was it worn by a zombie or someone trying desperately to stay alive? Killer nails, fake of course but part of the hand, not the glove, the glove has holes at the tips of the nails. Men’s costumes rarely get the love the ladies receive. So I’m always looking at the details. I’m thinking this would fly off the shelves given half a chance. The show is running through October, do yourself a favor and go! Author LeahPosted on August 25, 2016 August 23, 2016 Categories art, Downtown LA, fabric craft, I love LA, museumLeave a comment on Art of Television costume design. There is something in the water. There is a zietgiest out there, I’ve noticed it for quite a while. Certain topics, movie themes or exhibits seem to hit at the same time. This time it’s men’s wear. LACMA has it’s large monumental exhibit and FIDM has it’s much smaller Man Mode Same 18th century embroidered outfit. Style and fashion aren’t new. What tends to survive in the textile world are very high end garments such as these. Probably not worn often either. A smoking jacket Made out of silk cigar bands. These smoking jackets were popular in the 19th century. Nomad caftan looks it’s from the Steppes of Asia. Another smoking jacket, well the model is smoking, not sure that was it’s original purpose. Wonderful embroidery. Much more modern vest, with all kinds of foxes. These days ties are really where business can show their individuality. These are from the 50s. And under it all one can be naughty. Love all the fabrics, textures and decorative use of zippers. Of course this is runway only. Well worth a visit to FIDM. Author LeahPosted on August 1, 2016 August 28, 2016 Categories art, Downtown LA, museumLeave a comment on There is something in the water. Kay Spilker is the curator who has been responsible for putting on many of the wonderful fashion exhibits. As a docent I always enjoy the behind the scenes lecture that she shares with us. I always learn something new. In the late 18th century wealthy young Englishmen went to Italy for the Grand Tour. Before they left home they would have looked like the model on the left – everything changed when they came back. Bright colors, tighter pants, shorter jackets, bigger wigs and all kinds of extra finery, from feathers, cocades, and tassles. They were then called: Macaroni. I think back to the song we sang in childhood. Yankee Doodle went to town a’ riding on a pony. Put a feather in his cap and called it Macaroni. I never understood that line, I always wondered if I misunderstood the lyrics. Turns out that this is accurate. The English made fun of the simple colonials in America, who of course wanted to copy the fancy young men in England. The Americans turned the tables on the Brits, they adopted the song as their own and often sang it during the Revolutionary War. I wasn’t paying attention to the names of the designers, but I’ve always liked Viviane Westwood. The accuracy of matching the plaids is incredible. And the shoes, love the shoes. I would love to wear this outfit myself. Another take on plaid, or actually houndstooth. What grabbed me here isn’t so much the deconstruction but rather the antlers on the deer stalker hat. The original Hawaiian shirt was made from the brightest Japanese silk. I can’t get over the deep, deep purple. Another way of using silk, tie silk to be exact. Like the previous outfit – these are runway fashions, not street wear. There was a lot of fine detailed embroidery, mostly on court garments. There clearly have been those periods in history when men were just as decked out in finery as the women. They even had the same kind of undergarments and dressing needs as women. Of course making fun of the Dandy in the 19th century was no different than today. Most of the clothes in this show are very very expensive, but none more so then these Shoes made from money. My favorite part of the exhibit was being able to share it with my son and son in law. The next exhibit was Royal Hawaiian featherwear. Beautiful, colorful and very delicate. I really didn’t read much about it, I just enjoyed the visual aspects. For the royal men – bright capes. For the women, only feathered crowns on their heads. I don’t know much about this tradition. What I do know is that in tropical climates, with bright feathered birds, humans will use those feathers for decoration. The feathers may be delicate, but the color doesn’t fade. I am grateful that LACMA puts on these exhibits. 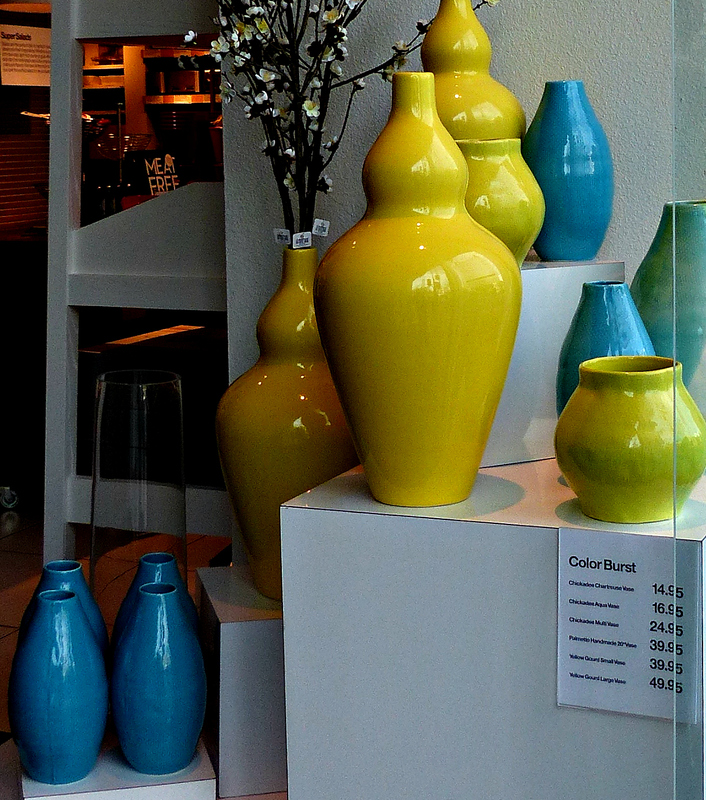 I’m not very interested in many of the art exhibits, but crafts, or should I say high craftsmanship always interests me. The holiday season is a good time to explore, the freeways aren’t quite so congested. So I went to Wilmington, not in Delaware, in Los Angeles. The isn’t exactly on the tourist maps of Los Angeles, but I always say, every place has something worth seeing. My destination was the Banning Museum. Being a lover of Los Angeles, I know more of it’s history than most people and I’m always excited to learn more. The name Phineas Banning has been lost to the mists of time. I learned about him when I became an LA Conservancy docent and started researching in ernest. A young intrepid man from Wilmington DE, he moved west and became a Stage coach driver. When the Spanish designated the Pueblo of Los Angeles, they weren’t thinking big, Phineas Banning was, he spearheaded the development of the port, first by building a wharf and a railroad that ran the 22 miles from Los Angeles to the port, later, as State senator he got federal funds to both dredge the port and create a deep water port as well as make sure that the transcontinental railroad would come to Los Angeles and not San Diego. He started the city of Wilmington, named for his birthplace and built his own home there in 1864. An expansive, expensive Greek Revival mansion. Three generations of the Banning family lived here until 1925. In 1927 it was donated to the city of LA and years later, another Banning descendent spearheaded the restoration of the building. Phineas Banning is one of the reasons why Los Angeles became the major city in Southern California instead of San Diego – which actually has a much better natural port. Today the Port of Los Angeles and Long Beach is the largest most active port on the West Coast. Seattle comes in second, Portland gave up on being a serious port a long time ago and the Navy took over San Diegos’ port. If you look at a map of Los Angeles you will see a very narrow strip from the south part of the city that goes down to the ocean. 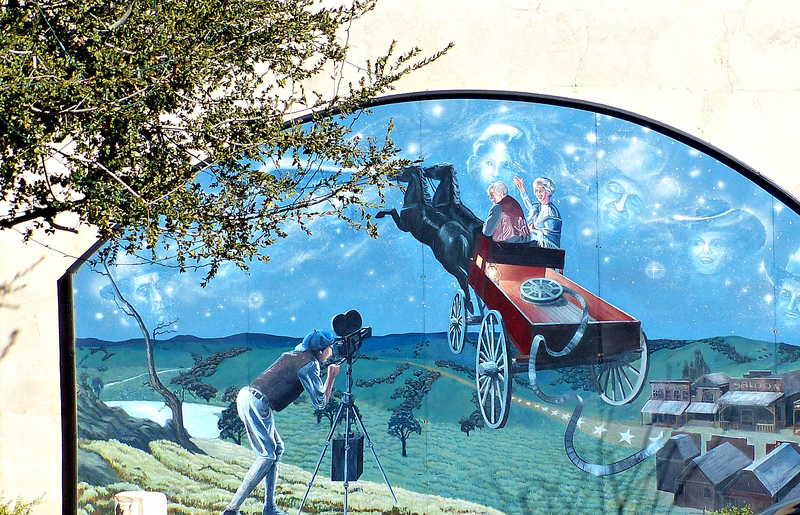 By 1909 Los Angeles annexed Wilmington and other small communities along the route to the harbor. Yes, they wanted not only to own the harbor but to be connected to it. One of these days I will write a whole post on how Los Angeles became so big and so interesting in it’s shape. Greek revival homes are symmetrical, through the years changes were made, notice the extra window on the ground floor? This window as well as the second window on the front of the building used to be on either side of the front door. So they match perfectly but they do disturb the symmetry. A sunken courtyard was added to the east side of the building, along with this marvelous cast iron fence. This is called the cornstalk fence. 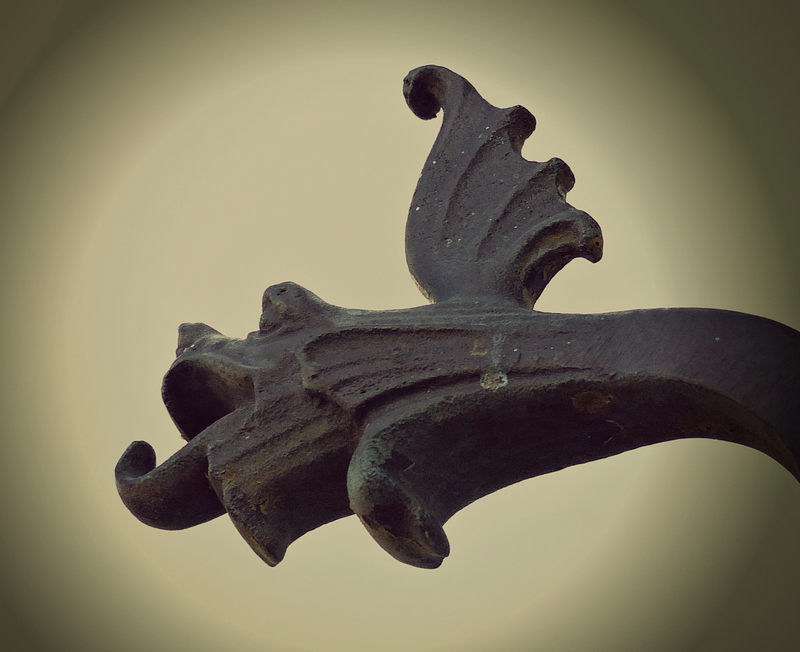 Made in Philledelphia and installed at the Banning Mansion in 1894. In researching this I’ve just discovered that the matching fence surrounds the Cornstalk Hotel in New Orleans, I will be there, staying at that hotel in a few weeks! WooHoo! You bet I’ll be mentioning this to the owners!! The interior of the home is beautiful, as well as the stables with their many examples of stagecoaches, some original, some reproductions. No photos allowed. 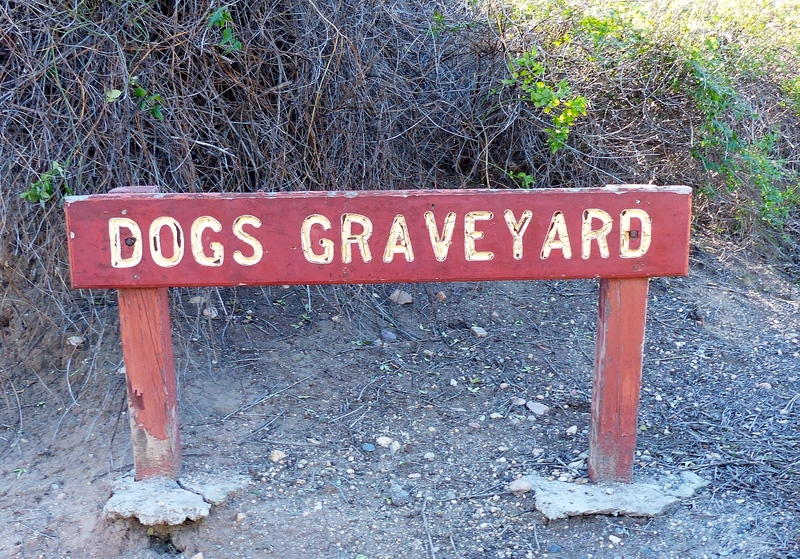 I highly recommend a visit to this landmark. I had a private tour with a docent, no one else around, so she showed me the modern water closet (as in early 20th c). as well as the chamberpots that otherwise would have been used. Think about it, in the mid nineteenth century the outhouse was a part of a home, no matter how large and grand. The port is very visible, it along with the largest oil field in California dominate Wilmington. So today this is basically a Hispanic neighborhood, middle class and comfortable. The downtown is a different story. I’m sure Wilmington has nicer areas to hang out in, the downtown is emblematic of many old downtowns, a little sad and rundown. A handful of beautiful old buildings with for lease signs. This large neon sign tops the Don Hotel built in 1929. Of course the sign would be seen from ships entering the harbor. Today like many such hotels, this is a senior apartment building. I do love the palm and the shadows they cast. Other attempts at decorating the buildings, a little lighthouse. Civic pride exists in every city, someone put a holiday ribbon on this utility box. I do need to come back, there are more things to see here, but this day, it was on to San Pedro. Anaheim is changing, but more about that in another post. This is about quilts. 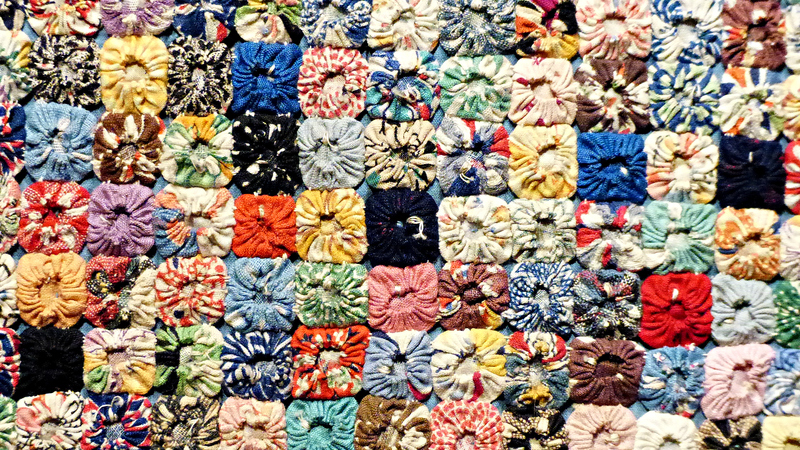 Old ‘modern’ quilts. A wonderful exhibit at Muzeo in Anaheim. 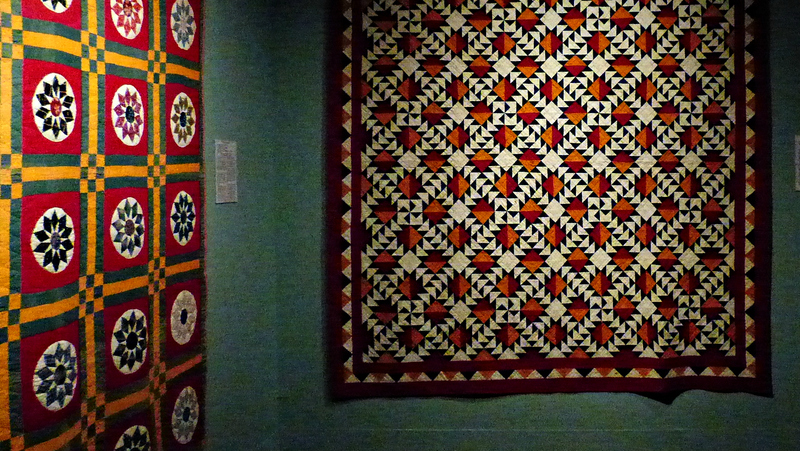 American Quilts in the Modern Age, 1870-1940 was created by the International Quilt Study Center & Museum at the University of Nebraska-Lincoln. Luckily my friend Becky heard about this and off we went. 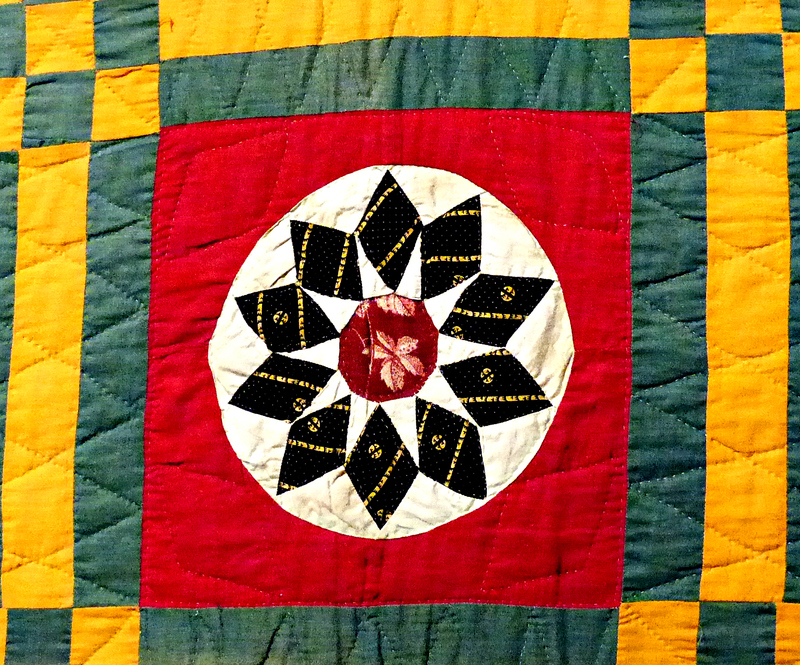 These quilts are from the early 20th century, but the colors – solids in bright colors, what today we call modern. Of course they predate the tiny calicos that many people grew up with. I must take a moment to thank Becky for showing me how to shoot photos indoors without a flash, I was doing it all wrong despite carefully reading the photography blogs. A close up. This is a traditional log cabin using the pineapple block. Wonderful use of both ‘low volume’ and browns. What an incredible layout, from the 1880’s. 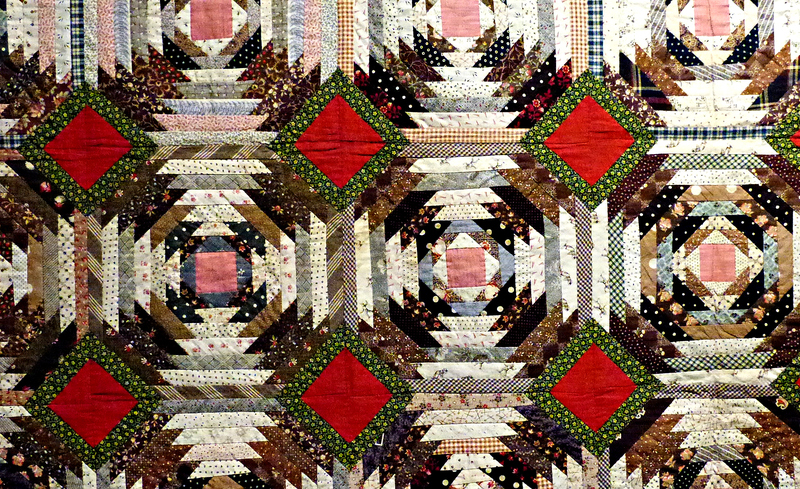 Here the quilt maker created standard log cabin blocks but divided each into dark and light. The dark blue, browns and background are all prints, the pink is solid, but what a vibrant pink it is. Also, the layout! Creativity is what drives women to quilt, and here we have a woman who’s graphic sensibilities would put her right at home now. Of course we fool ourselves if we think that 100 or 200 years ago people weren’t as creative as we are today. 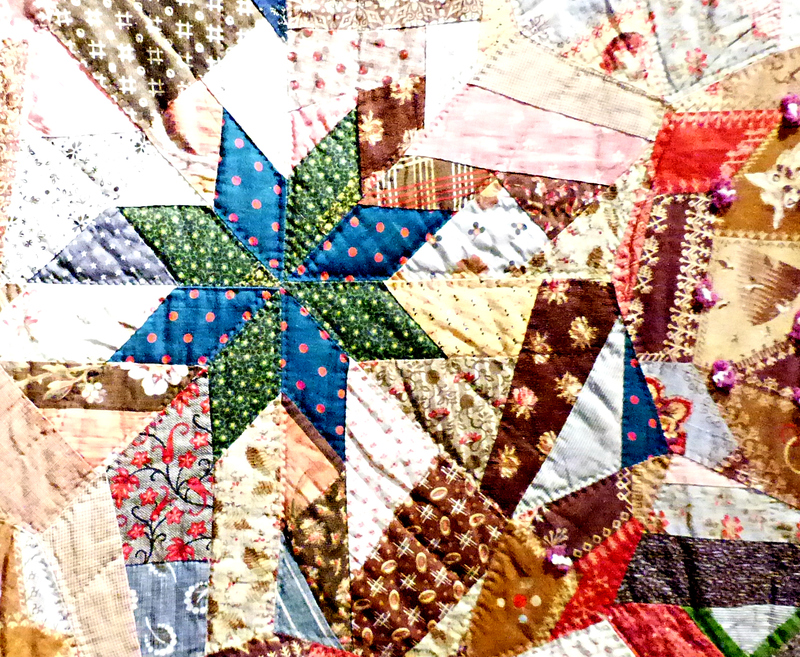 This is a crazy quilt with some very clear and definite stars. It also is a clear indication that Fussy Cuts aren’t a new invention either. I saw the spider and his web elsewhere on the quilt, but it looks like the red portion of the web is another fabric that was put in place. 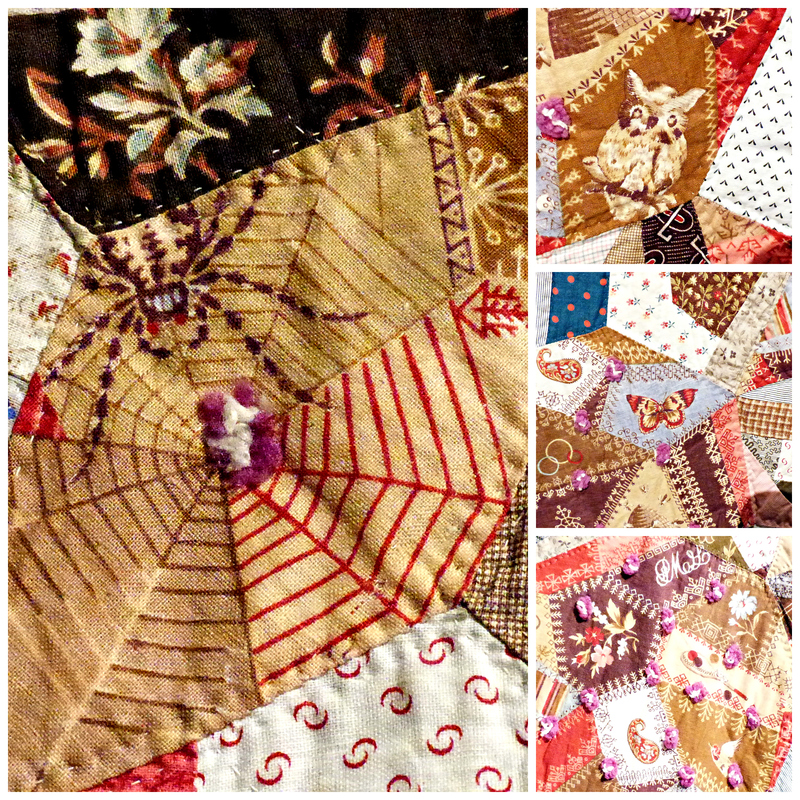 It may have been another color way or simply the quilter was extremely detail oriented and created this on her own. Of course I’m going to be drawn to hexagons and equatorial triangles. No doubt these were done with the English Paper piecing method. 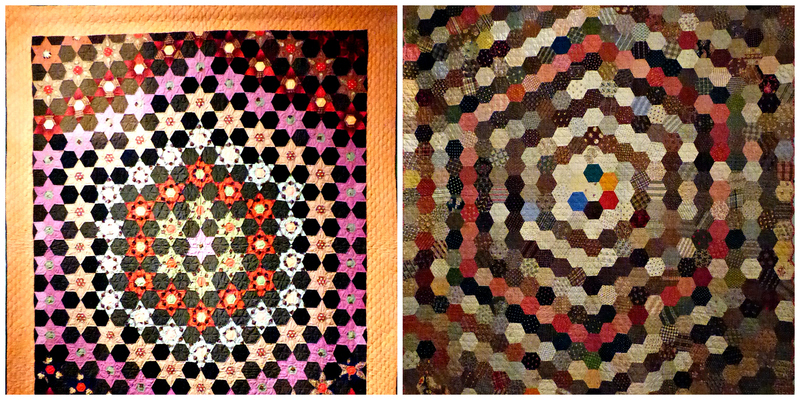 Notice how vibrant the colors are on the quilt on the right, that bright orange border was a sight to be seen. Speaking of tiny detail. 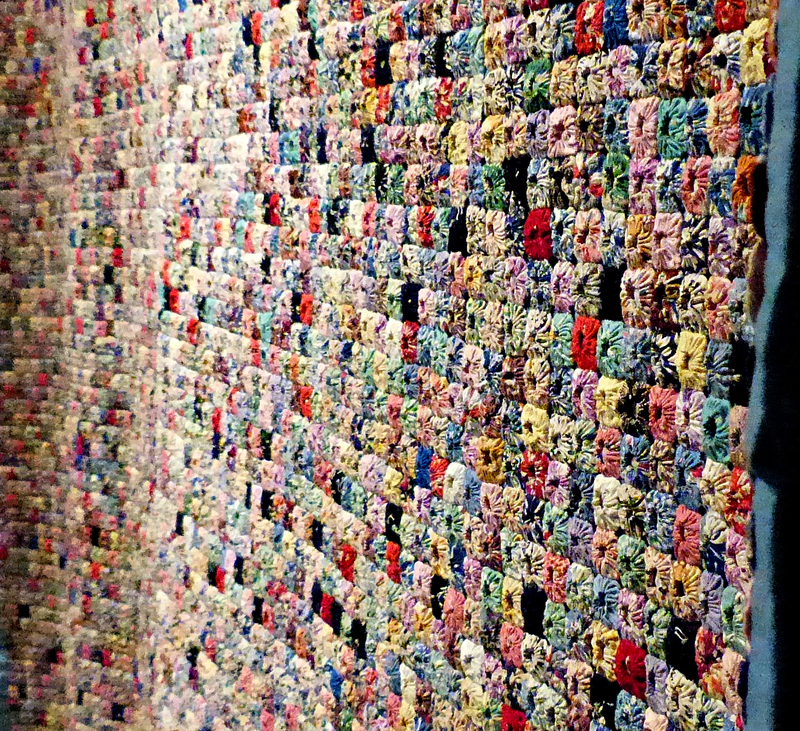 This quilt is made up of more than 14,000 tiny yo-yos. Each about the size of a dime, or even smaller. If you look closely you can see the thread poking out of the centers of the yo-yos. 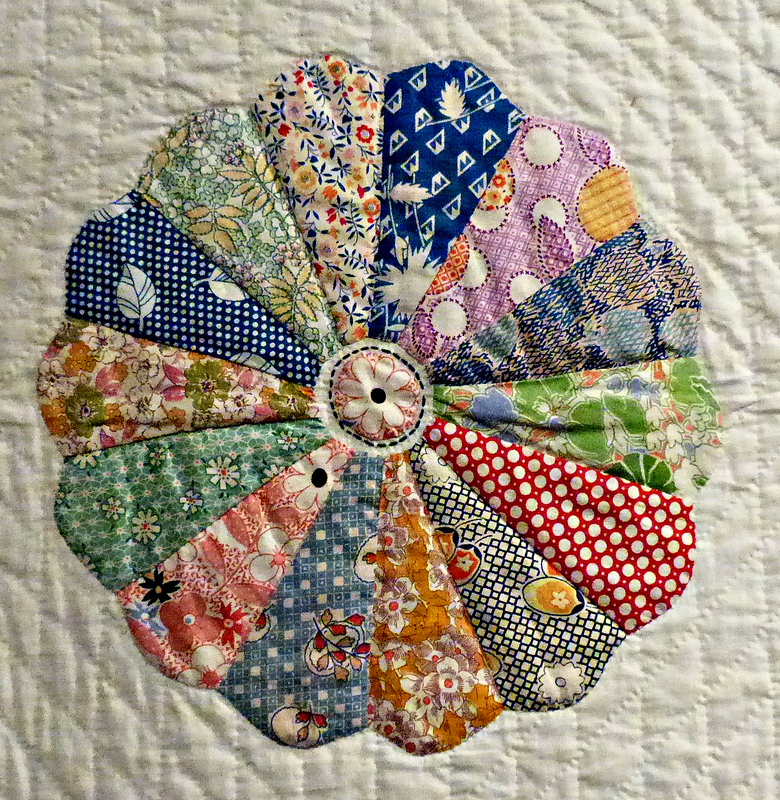 And now to a quilt using the fabrics that would define quilting for many years to come. A Dresden plate made in the 1930’s-40 with the popular fabrics of the day. A couple things to note here. The fussy cut center. 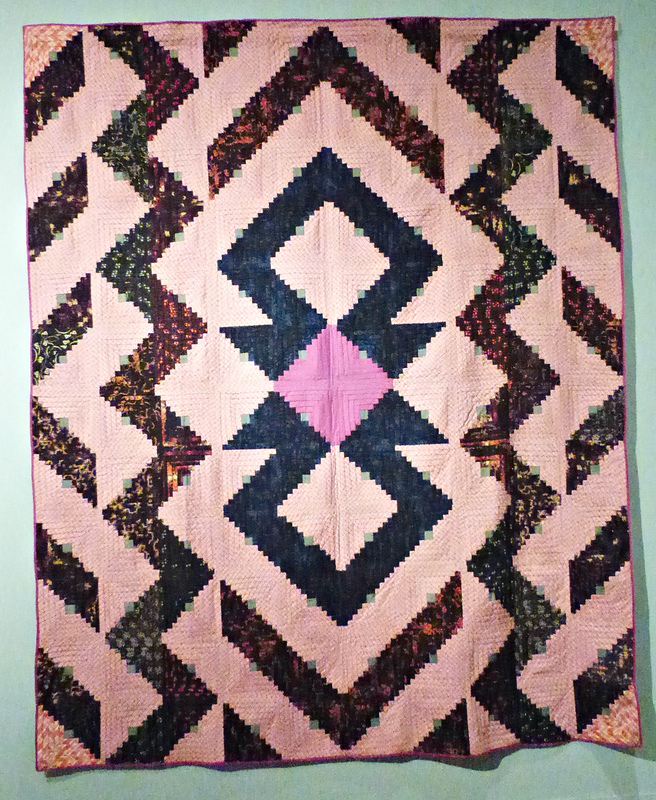 Also, the black outline in the center is what today modern quilters consider hand quilting. Not the case, the tiny fine almost invisible diamonds are the hand quilting, that thick black thread is a line of embroidery. This show is small and wonderful. 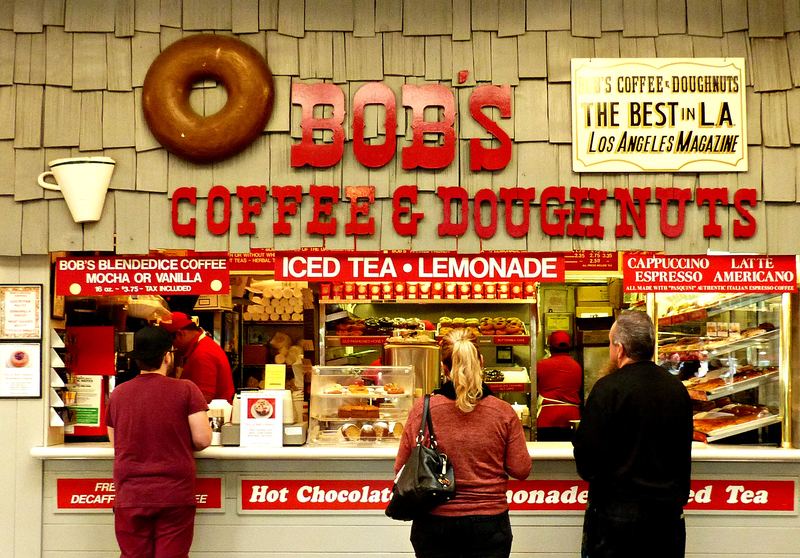 It is only up until Feb 15th, so I highly recommend a trip to Anaheim. Next post will give you other reasons to go down there. Sometimes having out of town guests is a reason to take my camera to places that I frequent every week. I’m usually at the Farmers Market on Thursday evenings, knitting and chatting and not taking any pictures – unless they are of knitted items. So it was fun to show off my local hangouts, to some out of town visitors. As well as having Yoch and the other Leah along. 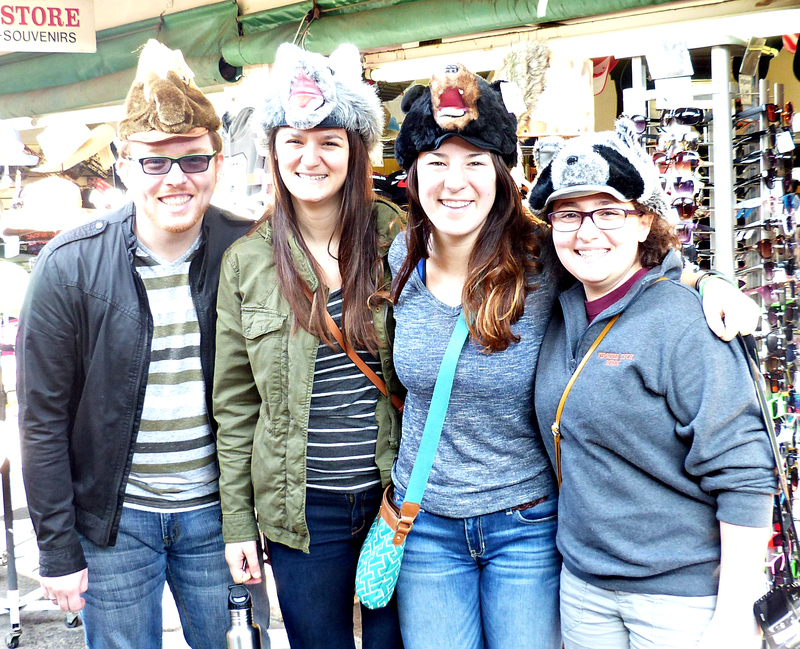 Of course the first thing anyone would do is put on goofy hats. No we didn’t get any donuts, but this is a favorite on knit night. 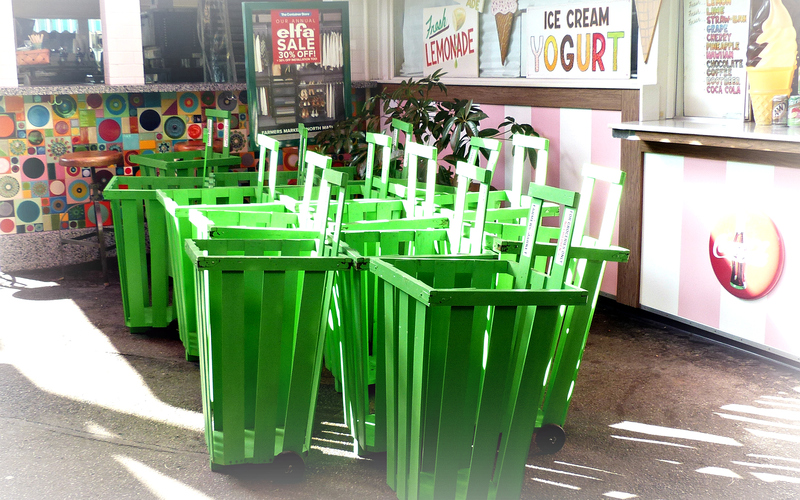 These rather uncomfortable looking shopping carts have been a staple at the market for over 75 years. This time I tried to capture color and texture. 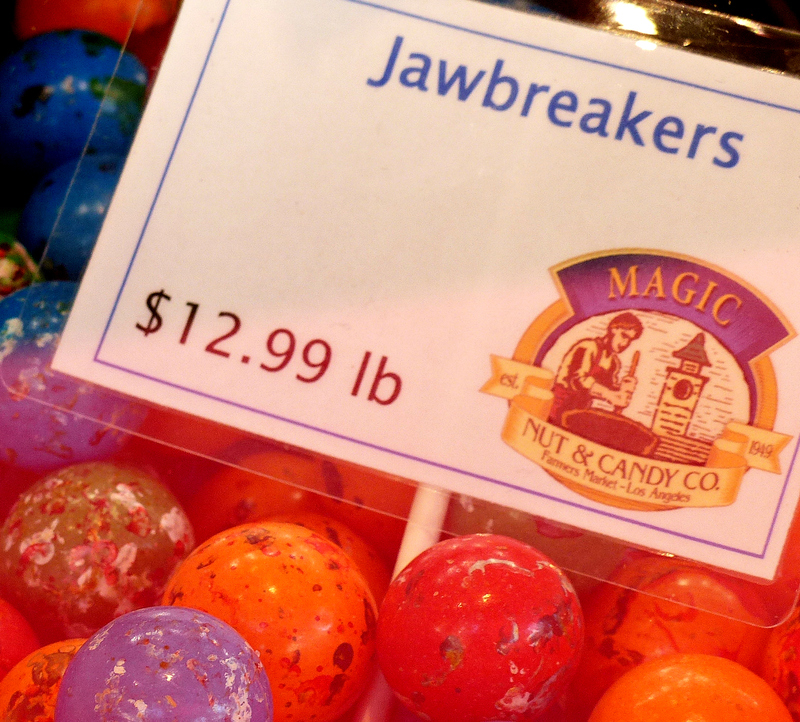 Old fashioned candy. And big massive super sized ones. I’m seeing a color theme with the green and teal. 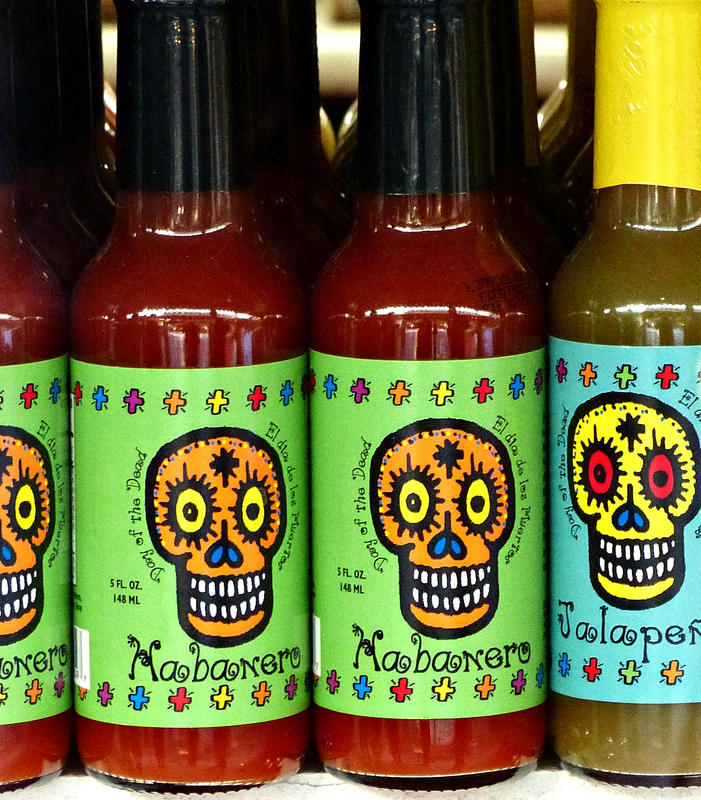 We wondered over to the Grove, and the colors were also found there. 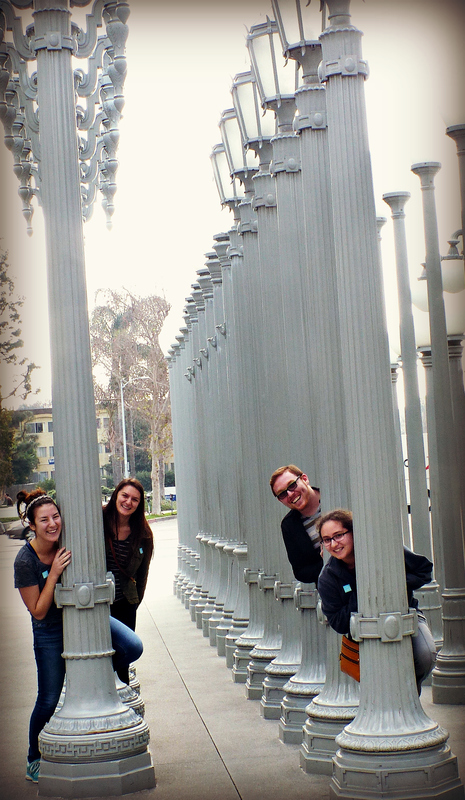 Then it was on to LACMA, I’m usually there on Wednesdays for lectures or docent activity when the museum is closed. Nothing more iconic than hiding among the street lights. 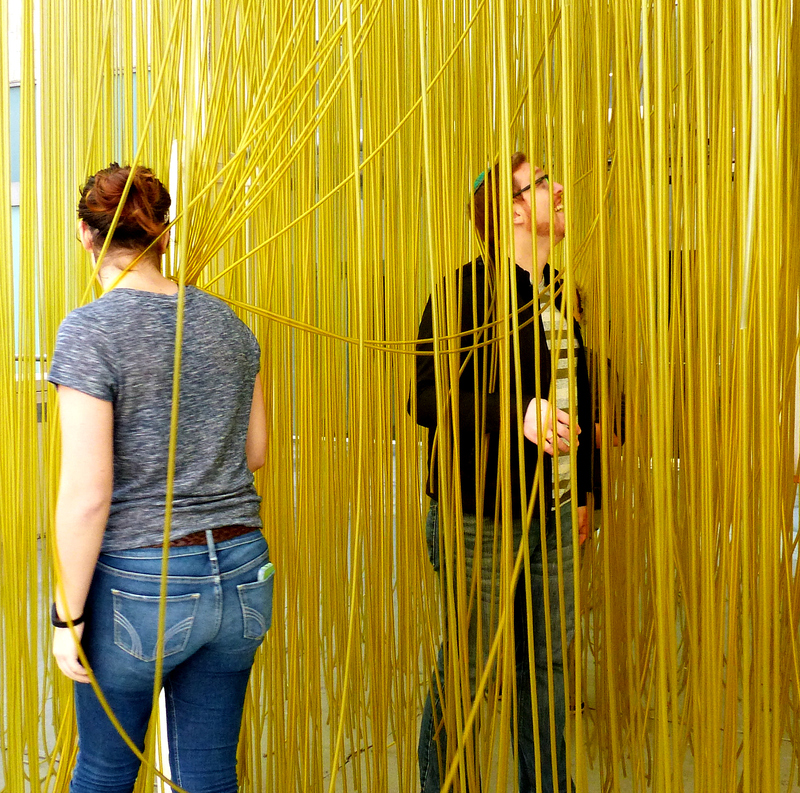 Or wandering through the yellow spaghetti. And even noticing how different art works can be very very similar. 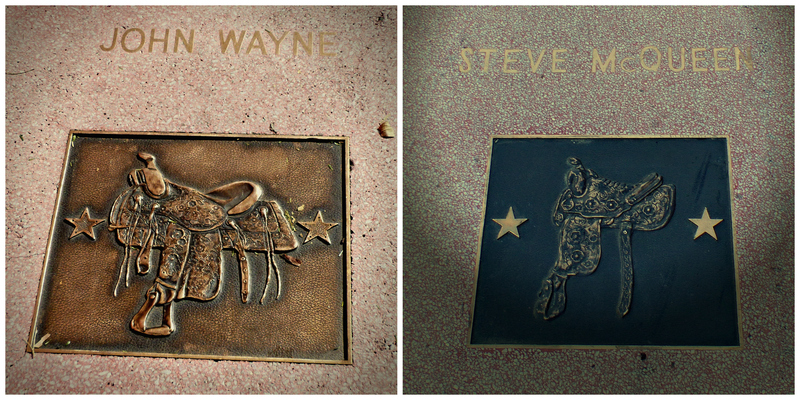 a mural on the newly revamped Main st. And plaques in the sidewalk honoring the many Western Stars who filmed here. One man has much more than a plaque. William S. Hart , an actor that we have pretty much forgotten. A man who acted in theater and Vaudeville who at the age of 49 comes out to Hollywood and becomes a movie star in the silent movie era. One of the first stars of the gritty Westerns. What prompted him to establish a working ranch and build a beautiful home out in the middle of nowhere ? My gaydar was clanging. Very handsome man, actor, great taste in design. I looked a little further, was married for a very short time (beard), had a son but no mention of any real relationship with him. Back in the 20s building a home in the San Fernando valley would have put you at the end of the world. So I asked some film buff friends – yeah, you won’t find it in any official biography, but my impression is probably the correct one. 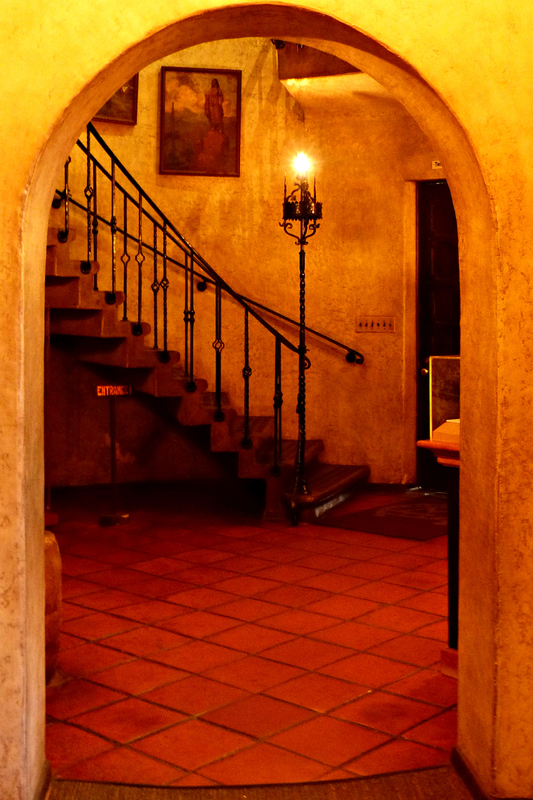 His home La Loma de los Ventos was built in 1924 and he lived there until he died in 1946. At this time even the San Fernando Valley was a distant outpost. When he died at the ripe old age of 80 he bequeathed the home and ranch to the State with the stipulation that the home would become a free museum and that there always be animals on the property. today there is a lovely park and petting zoo right behind Main St. In order to get to the house, one needs to hike up the hill. (There is a road, but it is only available for service vehicles. 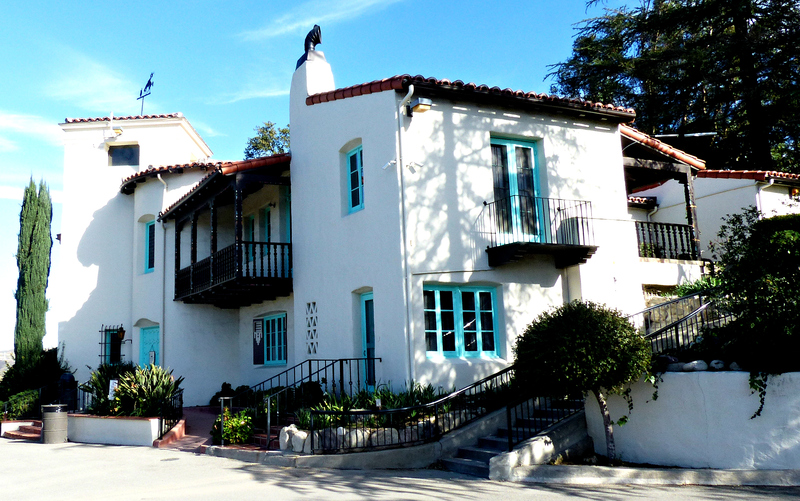 A beautiful home built in the Spanish revival style that was very popular in the 1920s. Beautiful painted word work. Interesting metal work. 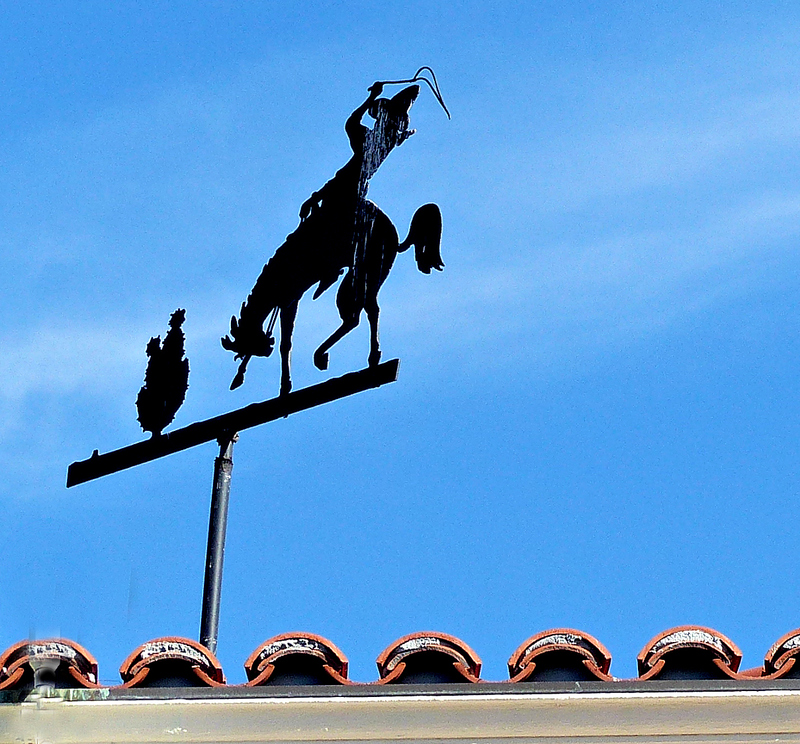 And a great weathervane. Inside the house is very spacious and gracious. 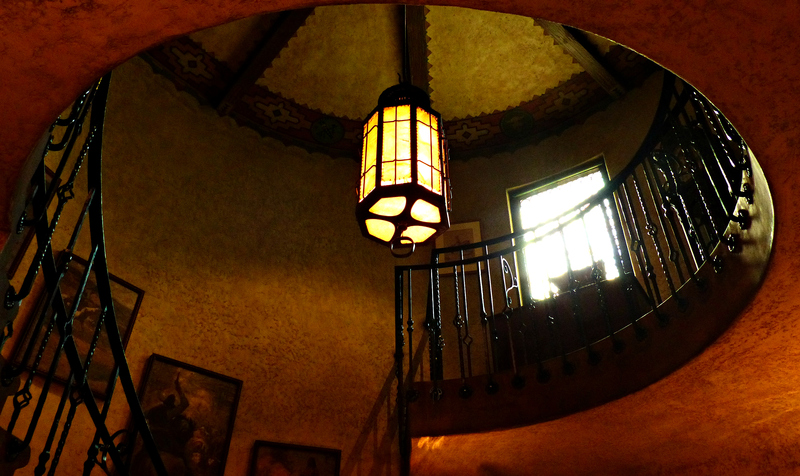 Looking back into the entry foyer. A wonderful round area. The stairs and the circular landing are all created out of one block of concrete. The walls of the house are very thick, so that must be part of what supports this stairway. It’s a little hard to see but the circular roof is basically a very large wagon wheel. 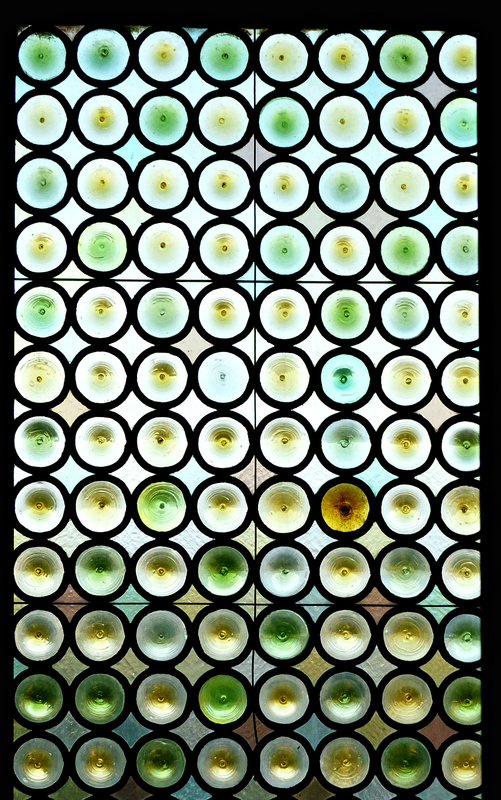 The stained glass window at the top of the landing is made out of the bottoms of many glass bottles. 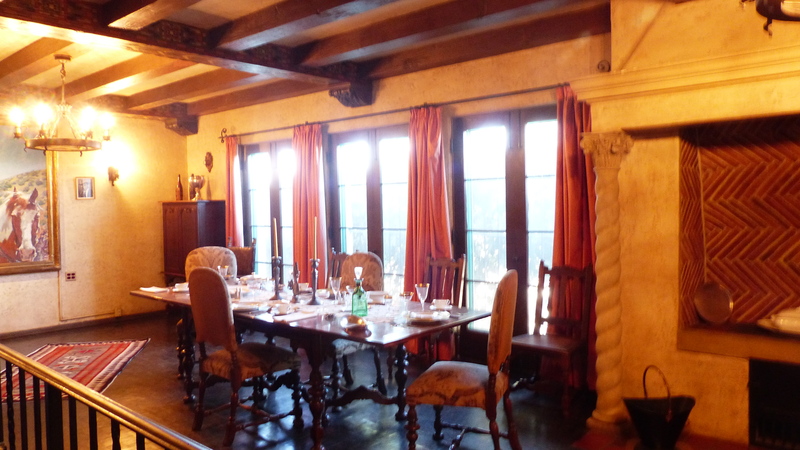 The large comfortable dining room. 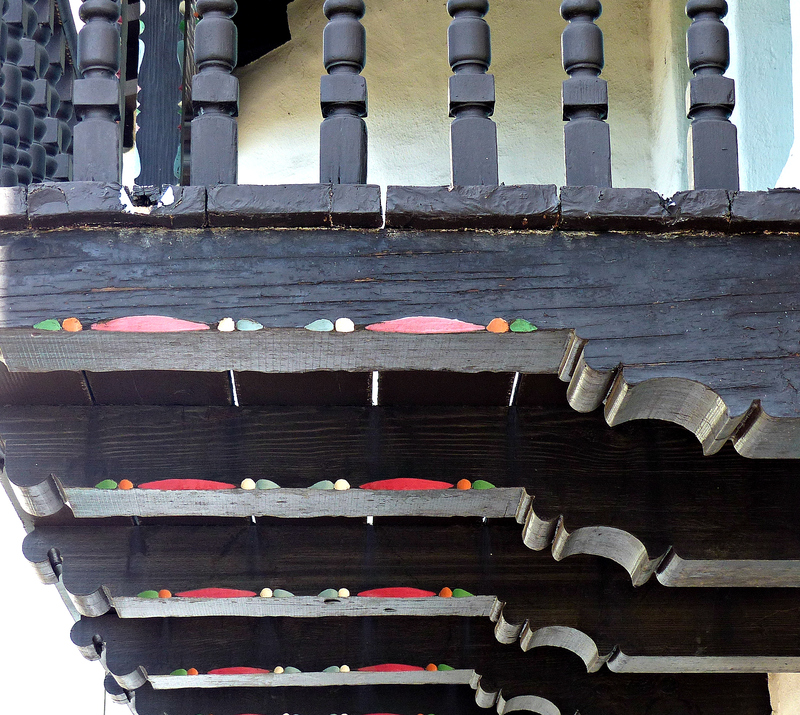 The railing was added to keep the visiting public out, that was not an original part of the house. William LOVED animals, he had his favorite horse Fritz and a few great Danes who had their own bedroom. 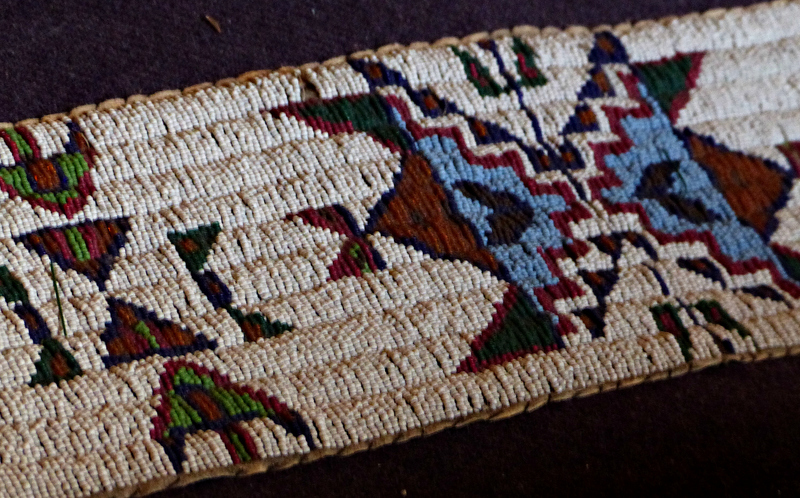 This wonderful beaded blanket was one of a pair of couch size dog beds. Maybe they didn’t sleep on these beds, since I would have expected most of the beads to be rubbed off. The sign is here along the road, but the area is blocked off. 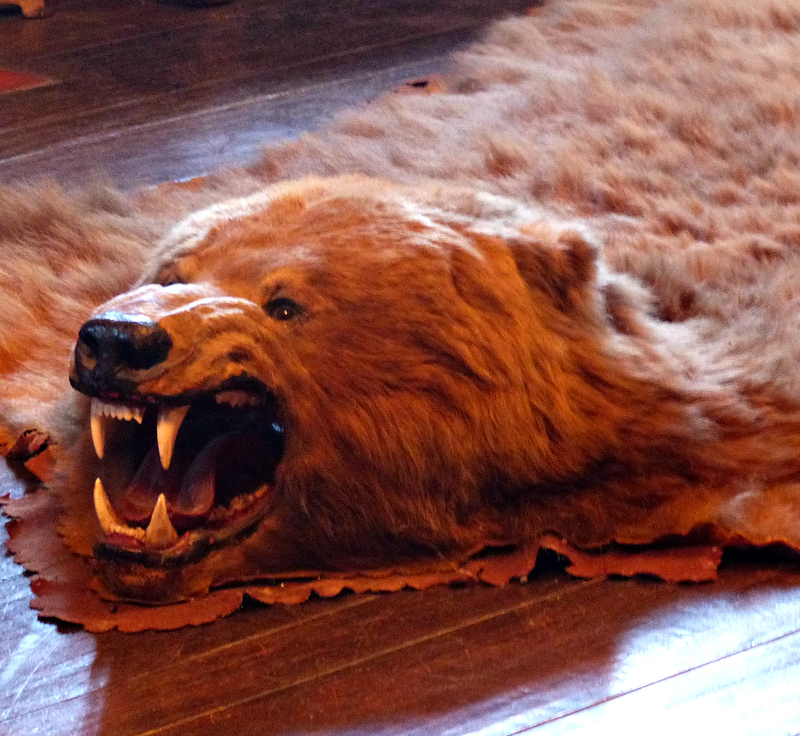 I could never live with this bear rug in my house. Not because I’m upset about hunting bears, I’m not. But the thought that I or anyone would slip and land on those teeth!! How to you explain that awful wound when you rush to the ER! There are many wonderful examples of Excellent Western art, from Frederick Remington, Charles Russell and Joe de Yong. These names may not be familiar to the average person, but these are the biggest names in Western Art. Which may explain why this house/museum in under the auspices of the Natural History Museum. No place is too boring or pedestrian. No matter where you are, do a little bit of research, you will be surprised by the hidden treasures that may be hidden in plain sight right behind the average looking suburban housing complex.